Fill this trivet with keepsake corks so only wine memories remain, not surface burns from hot pots. A fun, eco-friendly way to turn your love for wine into a handsome home accent. We supply the solid mahogany frames and instructions. You supply the wine corks and imagination! Preserves memories, protects surfaces! Fill this trivet with keepsake corks so only wine memories remain, not surface burns from hot pots. A fun, eco-friendly way to turn your love for wine into a handsome home accent. We supply the solid mahogany frames and instructions. You supply the wine corks and imagination! Mahogany sourced from sustainable tree plantations. Approximately 30 wine corks are required to complete this Wine Cork Round Trivet. Note: Wine corks vary in size. Can you stain the wood your own color stain? BEST ANSWER: The round wine cork trivet kit comes with a beautifully pre-finished piece of wood. Therefore, if you are using a stain that can be applied over a previously finished surface, then yes you can stain it. If your stain must be applied to an un-finished surface, then you would have to strip the surface before applying the stain. Hi as stated above, the cork trivet kit comes with a beautifully pre-finished piece of wood. Therefore, if you are using a stain that can be applied over a previously finished surface, then yes you can stain it. If your stain must be applied to an un-finished surface, then you would have to strip the surface before applying the stain. The wood has a light finish/seal on it already - don't know that much about wood staining but you probably could go a little darker, just allow for drying time. I bet it would work if you sanded it out and then put your stain. But it's a good fine finish on this wood piece already. Good luck. You would have to sand it first. It is already stained. Can the plastic or fake corks be used in trivets? Probably not but I had to ask. BEST ANSWER: I do not see why you could not use synthetic corks. That would not be such a great idea for trivet because wouldn't the plastic corks melt? Real corks should be used. BEST ANSWER: Thank you for your question. This item has a diameter of 8". Hot Dishes, easy to handle. I bought and co-designed 5 trivits as gifts. We had great group fun and used up years of saved corks. We needed a roll of pre-glued cork liner to pad the inside and raise the level so as not to hit the edges of the trivit before contacting the cork center. We also used extra glue to "grout" the corks after they were glued in place. I saw these and thought they would be absolutely great Christmas presents. I bought 6 of them and ideally wanted to put each persons first initial into the design. It's harder than I thought it would be for sure. The corks don't line up and it's almost impossible to make the design on the box because there is too much space between corks and it looks odd. I haven't given up! Just taking longer than expected. I would recommend this to anyone that's crafty and has some time to play with it! Love it! Super high quality per usual via wine enthusiast! Recommend this product , two thumbs up. Exciting project, make sure you have a sharp knife and course sandpaper. I love this - what a fun project! I'm planning to assemble these kits and give them as gifts. They're perfect for that and I reduce my supply of used wine corks! Good looking, easy to install and functional. this one is the most fun as you can cut your corks on angles to make them fit around the edge and use your large corks standing up (Champagne Corks) in the middle to make contact with smaller pans. I really like the design and the construction. You couldn't make this one yourself at this price. I love this trivet!! The best part about it is that you make it personal. I had several different colored corks I used and it makes my trivet unique. 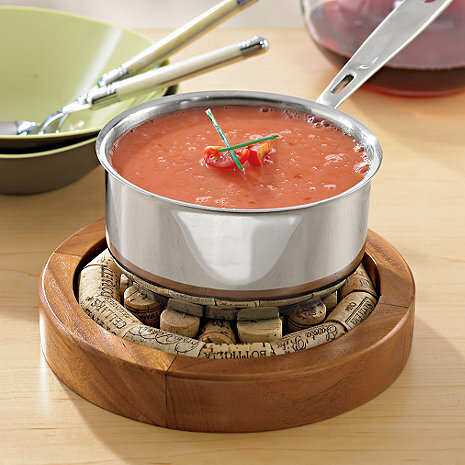 I love it when we do fondue and the pot is too hot to handle! Beautiful quality but wish it was shallower for laying corks on side. Really needs them on end which involves cutting them and losing the names printed on sides of corks. Basically put your corks in and glue them down. Works in looks great! Like all of the kits I have bought and made..it is perfect....easy to assemble. Always 'the gift' that everyone wants at our Christmas exchange. My favorite gift to give this year. I was very pleased with the quality of the wood. After some trial and error, I came up with a great design for the challenging round trivet. My husband sat right down and worked out a design the week after he received this as a gift. He's thrilled because he used all "Washington State Wine Corks" that are meaningful to him. I just finished making this trivet. It does require a little time and patience. The corks need to be cut to fit and it's just trial and error and moving them around a bit. I agree with other reviewers who said that the sides are high, they are and unless you line it with something, the corks sit down in it a little. A great way to display some of the wine corks we brought back from or vacation in Italy. The delivery was exactly when they said it would be and everything was in perfect condition. This is a smart looking trivet that you make just by decorating it with the corks you have saved. The instructions are very basic and should be more detailed with example layouts for those of us who aren't artistically gifted. They make excellent gifts and naturally great to keep for your own personnal use. Corks I've been saving fit perfect in these kits for Christmas gifts All my kids loved them and have used them. Work great for smaller hot plates/pans. I recommend them! We bought several of these and put the corks in vertically instead of horizontally so we could cut them off just above the rim and then turn them over so the finished edge (without the wine stain) shows. We then personalized them with stamped designs or initials into the top of each cork. We are giving them as a set. Cork Trivet pictured is bigger! The frame is too tall and the product much smaller than pictured. Corks do not easily fit. I am currently trying to build the corks up so that the trivet makes sense. The trivet is too deep for only one layer or corks. The corks either have to stand on end or double the layer in order to get the cork surface above the edge of the trivet.